On Saturday, April 27th we will sell storage unit contents at the following locations: Odem, Mathis, and Calallen. Please continue to check website for order of sale and times. This will be a no reserve auction of 29 storage units located in Odem, Mathis, and Callalen. The number of units and their location will be updated as we get closer to the auction date of 4/27. Buyers can register online at the preregistration link above or at the storage site before the auction. We will begin registering for the auction at 8:30am at the Odem location. You do not have to go to Odem to register for the Mathis or Callalen locations if you will only be going to those locations. We will register buyers at those locations as well. You can also register on this website as well. Just click on the “Pre-Registration” link above. Call 361-726-6243 for questions or more information. 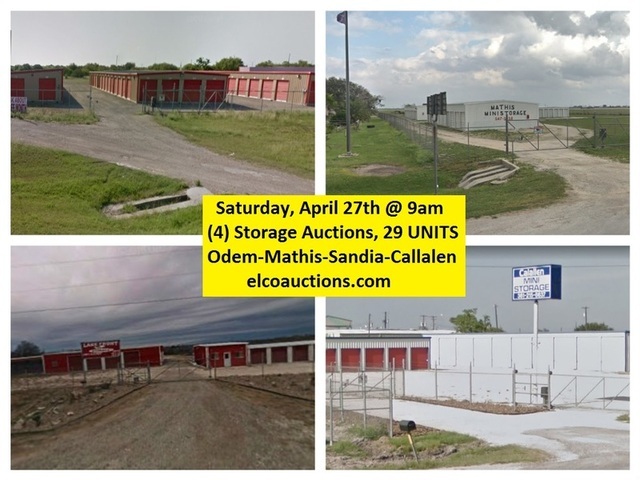 The times that are listed are approximate, we will start registering bidders at 8:30 AM, we will begin selling at the Odem location @ 9am, then go to Mathis, then Callalen. A refundable $50 cleaning deposit will be charged to each sold unit. This will be returned by the storage company when the purchased unit has been cleaned out and all contents have been removed. D.Jennings TX Lic 12078 All lots will be sold as-is, where-is with no warranties or guaranties expressed or implied. 10% Buyers Premium on all purchases. Payment terms are cash only.